Johnny Depp has teamed up with rockers Alice Cooper and Aerosmith’s Joe Perry as Hollywood Vampires and they’re heading to the SSE Hydro Glasgow in June. Known more for his acting roles over the years, Depp has always been a keen rocker, recently seen popping up in Kris Kristofferson’s Glastonbury set last summer. This new project is bound to be a smash hit, with Alice Cooper lending his snarling vocal to the mix, along with Perry’s blistering guitar work. 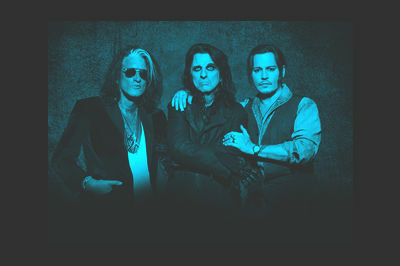 Hollywood Vampires play the Glasgow venue on Tuesday 19 June and tickets are on sale.